Graffiti on a bathroom wall at University of Massachusetts, Boston. I'm always intrigued with graffitti. Whether it is filled with intention and purposefully meant to provoke or just the ramblings of people with nothing better to do. Bathroom graffitti is a special kind of graffiti as it happens at a time when people are engaged in other business. I've seen entirely conversations on the side of a bathroom stall go on for 8-10 interactions among different people and it reminds me of Tom Standage's Writing on the Wall: Social Media The First 2,000 Years. In this case, I was amused by message in that I first read it as "cat the rich" and all I could think was this idea of petting and scratching rich people behind the ears. 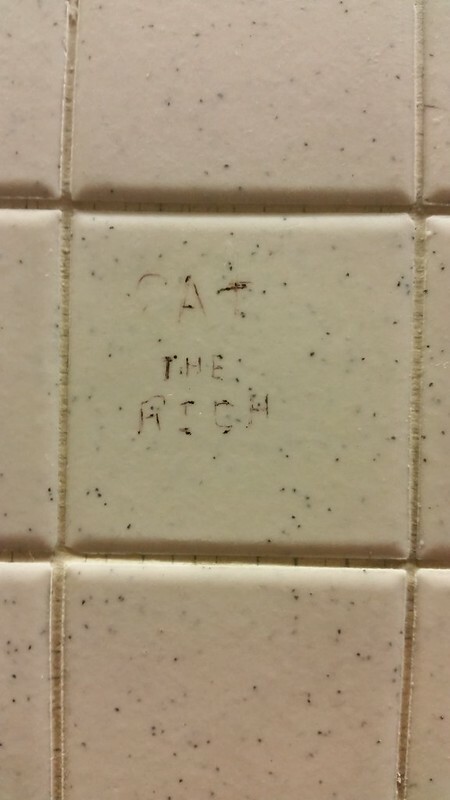 After being amused at this imagery, I realized it was "Eat the Rich." An interesting but fairly common message found on a college campus. But I always wonder what goes through the mind of the person who creates graffiti--are they hoping to inspire, looking to engage in dialogue, or just writing what comes to mind so that it no longer occupies their mind?